Hi guys! Recently Zoya offered a promo to get the 'Pinterest' trio for free; just pay shipping! I didn't have any of the colors from the beach or surf collection, so I was really excited to get this trio! The one I was most excited for was 'Zuza'! 'Zuza' is a beautiful mint/aqua green packed with shimmer. It. Is. Gorgeous. I change my nail polish constantly, but I know I'm going to be leaving this color on for a while!! 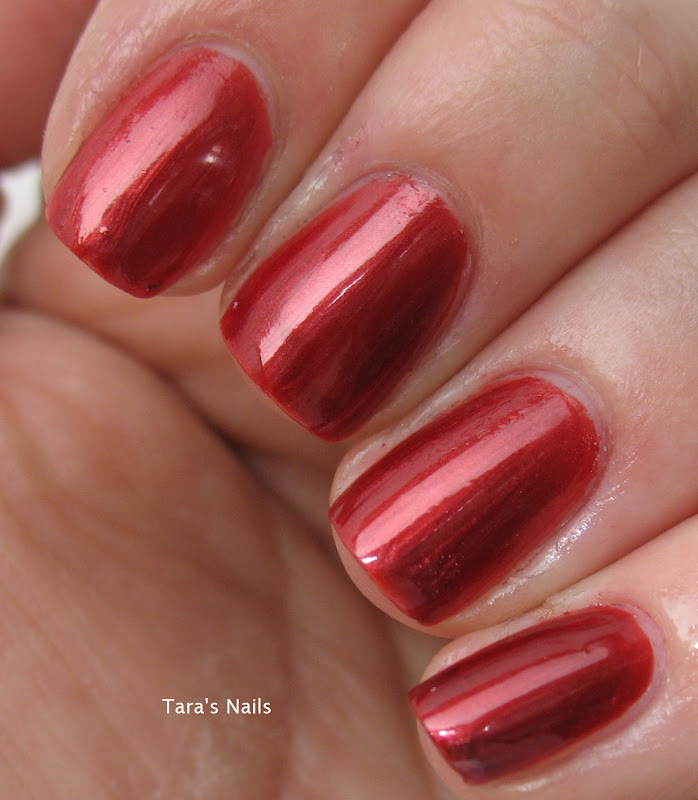 The formula on it was a tiny bit thick, and some dragging occurred on areas where polish was reapplied while still wet. I did two coats and the second coat even everything out. Here is 'Zuza'! Love, love love!! Hope you guys have a great Monday and week!!! Hey Everyone! Just got these in and I couldn't wait to share with you! I haven't wanted an entire collection in forever, but I just HAD to have this one!! So I caved and bought the entire China Glaze Summer Neon Collection! I will try to do real swatches, but in the mean time, here is a cool Instagram Pic! Hello fellow nail polish lovers!! Today's mani is another one decided by one of the polish facebook groups I'm in! It's holo hump day (hence the title!) and basically, anything holo goes! For this look I used three polishes from the China Glaze Kaleidoscope collection. I started with 'Octa Gone Wild', then 'Kaleidoscope Him Out', and finished with 'How About a Tumble'. I just free handed stripes... it kind of reminds me of cotton candy - - well, HOLO cotton candy!!! Hope you all have a great Wednesday!!! Happy Friday, everybody! Today was declared Gradient Friday by the girls in the nail polish group I'm in on Facebook. Gradients are one of my favorite forms of nail art... they are super easy, and look super cool! I love how you can mix and match colors and make them flow! 'IDK', and ended with 'DV8'. Added a layer of Seche Vite, and voila! I think DV8 and IDK could have been better blended, but overall I like it! Thanks for reading! Also, check out all of the other gradients fellow nail polish lovers created for Gradient Friday!! :) Have a great holiday weekend everyone!! I already have the concealer, and I LOVE IT. So I'm glad to get another one. It is a very lightweight concealer, and feels sheer on your finger, but it actually has really good coverage! The body spray is a fragrance I hadn't tried yet, and it smells really good, so that was a nice surprise! The scent doesn't last as long as a perfume, but I was able to smell it for a couple of hours after I sprayed it. Pretty neat, I think! Overall I liked these! Once I got the hang of applying them, it was rather quick and easy to put them on. No drying time - that is awesome! Awesome patterns - it's really easy to wear intricate nail art! Doesn't perfectly cover the nail - As you can see in my last picture, there is still some nail showing on the side of my ring finger nail. If I went to a larger size, the decal would have gone onto my finger itself. You get 16 in a pack - You only have 10 fingers, so you are paying for 6 extra stickers that you may not use. But since there are only 16, you can only get one application out of them. I suppose if you cut the strips in half you could get two manicure's worth out of one package, but that's extra work on your part. At the end of the day I love these for the cool patterns and no dry time. I probably wouldn't use them for just a plain color look, since applying actual nail polish does that better. Hi guys! Today I wanted to share a beautiful polish with you! This is Toxic Seaweed, by Cult Nails! Cult Nails makes some gorgeous nail polish, and Toxic Seaweed is no exception! It's an aqua/teal jelly base packed with green glitter and tiny flake particles that take on a coppery color in the bottle. Let's take a look at some pictures! That's three coats! Really pretty, huh!? This polish can be purchased over at Cult Nails. Hey Guys! Today I want to share with you some polishes I received from the lovely Paula from Brasil! She was showing me swatches of polishes, and as soon as I saw these, I HAD to have them. They are the brand DNA, and the caps say Italy on them! My motherland!!!!! So here are some pictures of the three I have! First up is "Natale". It's a blood red polish with a slight silver sheen in it. It's also kind of jelly-ish, in that it took a couple of coats to hide any visible nail line. These pictures are 3 medium coats. Next up is "Cosmo". 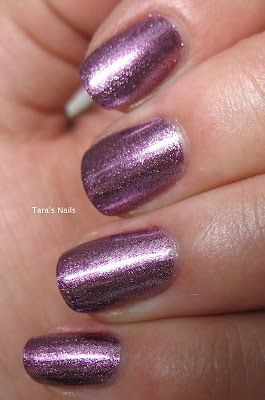 "Cosmo" is a pinkish-purple foil finish polish. This applied easily, and was opaque in two coats. I really love the finish on this polish! It reminds me of a Funky Fingers polish called "Favorite Girl". I'll have to see how similar they are. Thanks again Paula, for these great polishes!!! Have a great day everyone!